At first, I thought it was a train wreck & almost DNF’d. The ONLY thing I can say is – it isn’t what you think it is!!! It’s not often that mysteries take me by surprise anymore. 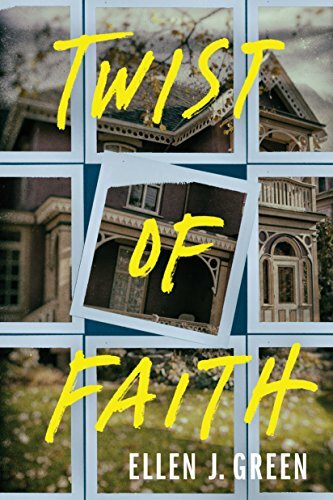 I had chosen Twist of Faith simply because it was a mystery and none of the other choices seemed appealing. Wow, am I glad I chose this book! There’s nothing quite like a good mystery that keeps you guessing until the end. If you like a truly enigmatic mystery drawn out to the last bloody clue, this one’s for you. At first, the mystery is simply a mesmerizing train wreck in slow motion; you want to look away because you think you know how it’s going to end, but you can’t drag your eyes away because it’s so incredibly vivid and fascinating to watch. But Twist of Faith is NOT a train wreck: every time you think the mystery is solved or crucial elements will be revealed, the mystery just gets deeper. Ellen Green reminds me a lot of Agatha Christie; she leaves you grasping at every clue, wondering which are real and which clues are red herrings. Every seeming cliché and every guessed-at trope turns itself slowly around, Janus-like. And like Janus, the face revealed is quite different than the visage we were surveying just moments before. Overall, while this would receive an R-rating as a movie, it would a soft R-rating. The author did a wonderful job of showing murder-mystery violence without getting horrific, a few sexual situations without being graphic, and enough profanity so we understood people’s characters without being inundated. I thought the author had a great balance that worked incredibly well. If you wish to see the curse word count, I’ve included it in a comment below. It’s not bad at all, very skillfully done. Very glad that I chose this excellent mystery for my First Reads / Kindle First January 2018 selection. Twist of Faith would definitely receive a soft R-rating. The author did a great job of showing violence without getting horrific, sexual situations without being graphic, and enough profanity so we understood people’s characters without being inundated. I thought there was a very nice balance. I went back and searched, just to verify, and I found the following. You’ll have to guess what the letters stand for, as I can’t put the actual words or derivatives without having my comment deleted. After the death of her adoptive mother, Ava Saunders comes upon a peculiar photograph, sealed and hidden away in a crawl space. The photo shows a shuttered, ramshackle house on top of a steep hill. On the back, a puzzling inscription: Destiny calls us. Ava is certain that it’s a clue to her elusive past. Twenty-three years ago, she’d been found wrapped in a yellow blanket in the narthex of the Holy Saviour Catholic Church—and rescued—or so she’d been told. Her mother claimed there was no more to the story, so the questions of her abandonment were left unanswered. For Ava, now is the time to find the roots of her mother’s lies. It begins with the house itself—once the scene of a brutal double murder. When Ava enlists the help of the two people closest to her, a police detective and her best friend, she fears that investigating her past could be a fatal mistake. Someone is following them there. And what’s been buried in Ava’s nightmares isn’t just a crime. It’s a holy conspiracy.